Tableau Geographique et Statistique du departement de la Gironde. 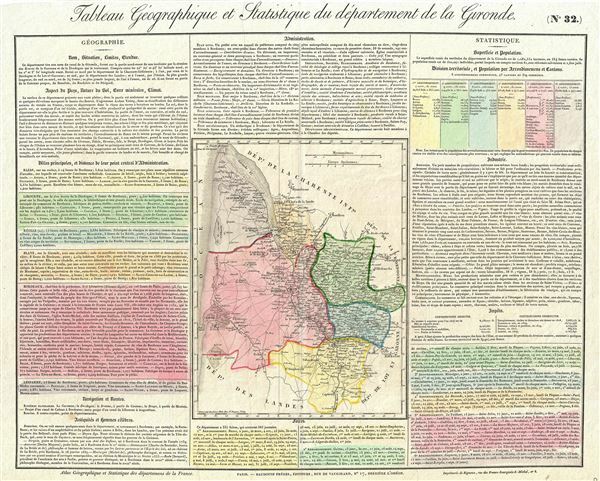 This is a fascinating 1826 map of the French department of Gironde by the Baldwin Brothers. This coastal department is the seat of the Bordeaux wine region and produces many of the world's finest reds. Shows numerous vineyards and chateaux. The map is surrounded by text on all sides, giving information regarding names, locations, administrative divisions, major cities, navigation routes, ancient and famous men, area and population, territorial divisions and population by cantons and arrondisements, industry, fairs, taxes etc. Administrative regions are color coded. This map was issued as plate no. 32 in the 1826 edition of Atlas Geographique et statistique des Departements de la France published by the Baldwin Brothers' (Baudouin Freres), Rue de Vaugirard , No. 17 , Behind the Odeon. Baudouin Freres, Atlas Geographique et statistique des Departements de la France, Paris, 1840.